An Easter Greeting to you all! Christ is Risen! 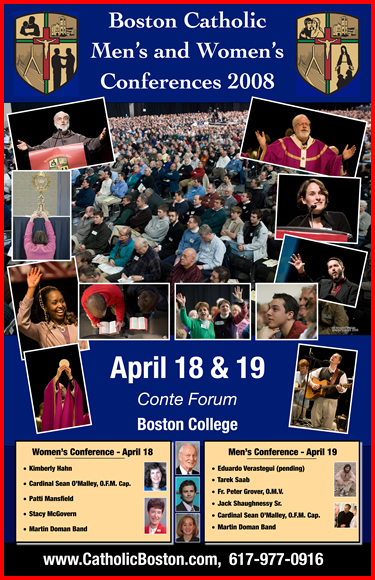 As many of you may know, on the weekend of the 18th and 19th of April we will be holding our annual Boston Catholic Men’s and Women’s Conferences at Boston College’s Conte Center. This is our first time in this venue and we are looking forward to having a good group this year. 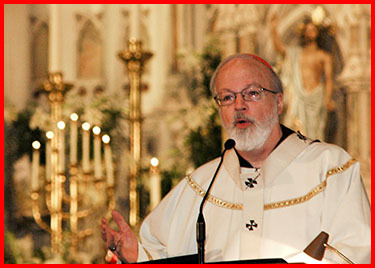 This year our conferences coincide with the Holy Father’s visit to the United States. 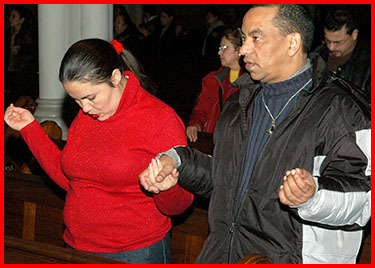 In addition to the 3,000 Boston pilgrims who are traveling to see the Holy Father in New York, we expect several thousand others to participate in the Men’s and Women’s Conferences. 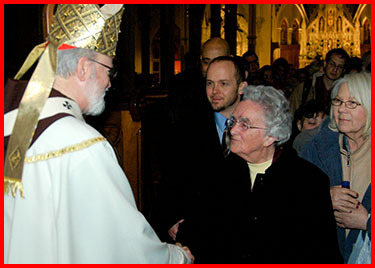 One of the wonderful outcomes of these conferences has been the formation of men’s and women’s groups in our parishes. We are anxious to promote this opportunity for people to come together and experience their faith in a very vibrant way. The conferences are an opportunity for people to reach out and invite friends and neighbors to be a part of the Church or for wives to invite their husbands and vice versa. 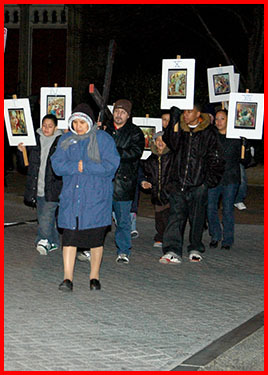 This is a very fitting opportunity to fulfill our role as evangelizers and witnesses of the resurrection. 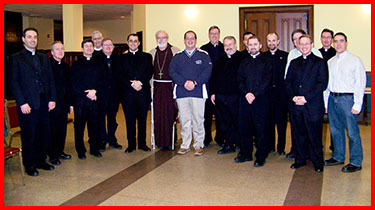 I would like to express my gratitude to the parish captains and all those who are working diligently to organize and promote the conferences and we look forward to another successful year in the Boston’s Men’s and Women’s Conferences. I certainly encourage you to check out their web site. 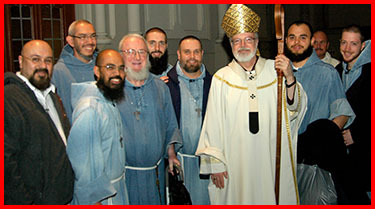 I try to meet regularly with the priests ordained in the last 5 years in what we refer to as the “Jesu Caritas” group. We have an hour of Eucharistic adoration, have a meal and share conversations on priestly spirituality, ministry and the spiritual life of the priest. 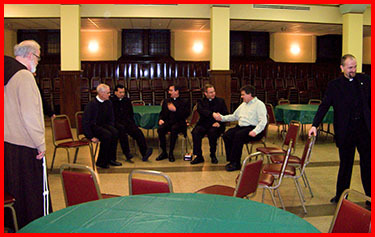 Our most recent meeting was held last week at St. Patrick Parish in Watertown and a good number of the priests were able to join us. We always have very lively and varied discussions, and in this last gathering we talked about the Pew study on religion in America and the challenges of passing on the faith in a secular culture. It was very interesting to hear all their perspectives on the issue. 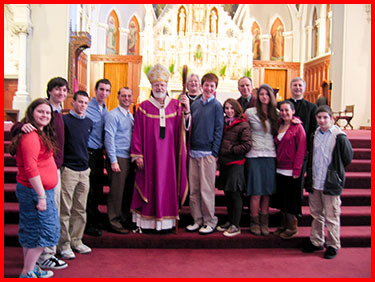 Last week, Father David Michael brought a group of Jewish high school students from the Gann Academy in Waltham to the Mass in which we commemorated the life of St. Patrick March 17. I was very pleased to see the Jewish youth there. I told them that corn beef and cabbage is the Irish Seder meal. I was also pleased that they were exposed to a religious aspect of St. Patrick’s Day, which unfortunately in the United States presented as simply high kitsch. On Holy Thursday I went to St. Joseph Parish in Holbrook for lunch and prayer with a group of priests including Bishop John Dooher. 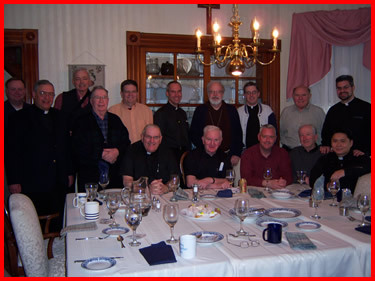 Throughout the archdiocese, many groups of priests come together on Holy Thursday for prayer and a meal marking the institution of the priesthood and promoting a spirit of fraternity among our priests. Last year I was happy to be at Father Jim Ronan’s parish, St. Mary – St. Catherine of Siena in Charlestown, and this year I was the guest of Father Ed Riley at his parish. In the evening, I celebrated the Mass of the Lord’s Supper at the Cathedral, which is, for me, one of the most beautiful celebrations of the year. 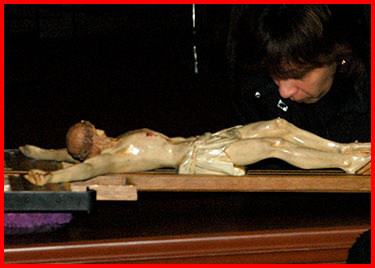 Unfortunately, I think many Catholics are very focused on Good Friday and Easter Sunday and forget the institution of the Eucharist, which is the source and summit of our spiritual life as Catholics. We gather as an Eucharistic people and Christ chose to institute the Eucharist in the context of a seder meal with his disciples. It was on that night that he washed the feet of his disciples and gave us the commandment of “love one another”, as he has loved us. He says farewell but at the same time gives us the Eucharist to assure us that he will be with us — always and everywhere — through the sacrament. 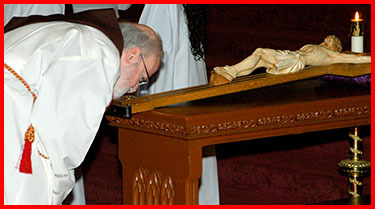 As at other churches, following the Mass the Eucharist is removed to an altar of repose where it may be adored. In our case, the Blessed Sacrament resided in the chapel of the cathedral. It was a beautiful Eucharistic vigil. Many of our seminarians were there as they were observing the custom of visiting the altars of repose of seven churches during the evening of Holy Thursday. 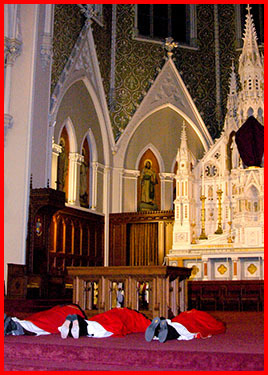 The chapel was also filled with students from Boston University and Northeastern University. 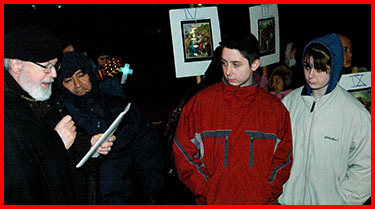 I suspect that these young people were doing the same and that they came to the cathedral as their last stop. It was a very beautiful experience and we ended with Compline at midnight. On Good Friday we had two services at the cathedral, one in the afternoon in English and one in the evening in Spanish. 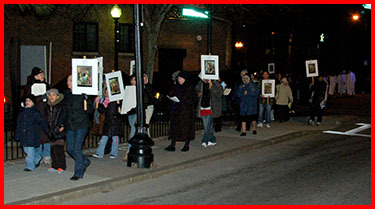 Following the evening service I led the procession of the Stations of the Cross through the neighborhood, particularly in the housing project where so many of our parishioners live. Sister Tanya and Father Carlos did a fine job organizing that and I thank them for their efforts. Saturday we had the Easter Vigil and it was our great joy to receive five people into the Church — three of them through the Sacrament of Baptism. It was, as it is every year, a beautiful celebration. The cathedral was magnificently prepared by Sal and Marie DiDomenico and Ted Fiori who work so hard with the decorations and the preparations. And of course, I would be remiss if I didn’t mention the wonderful work of the choir led by Leo Abbott as well as the Spanish choir. 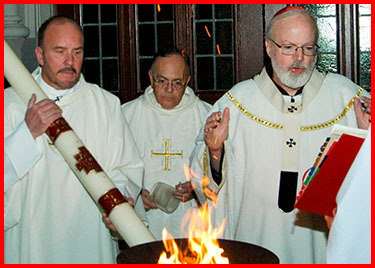 Certainly, the Easter Vigil with the blessing of the fire and baptismal water and the many readings taken from salvation history is really the highpoint of the liturgical year. 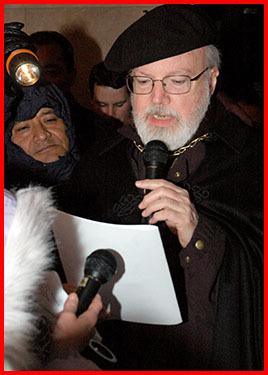 Blessed Charlie Rodriguez (who was a Puerto Rican layman) based his whole spirituality on the Easter Vigil. It really is the apex of our spiritual journey throughout the year. 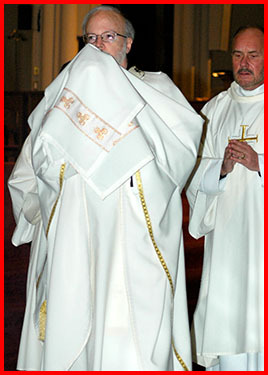 In the Latin Rite we tend to be very focused on Lent and the cross. 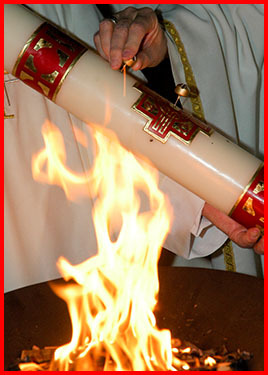 The Eastern churches — the Eastern Rites of the Catholic Church and the Orthodox Church — give stress to the Easter Season. I certainly think we need to stress more the Easter part our liturgical year. It doesn’t all end with Lent. Lent is merely the preface to our celebration of the resurrection of the Lord. 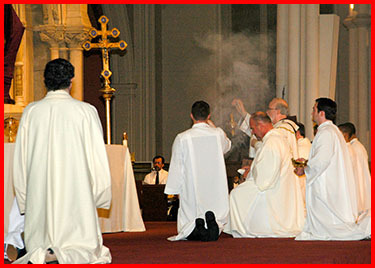 I was happy that we televise these liturgies in Boston through CatholicTV. 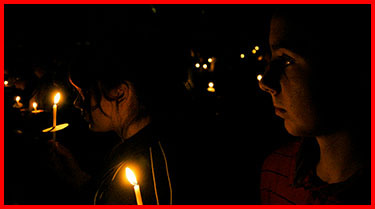 Many Catholics have never been to an Easter Vigil — they go to church on Sunday morning —and yet we’d like as many people as possible to experience the beauty of the Vigil. 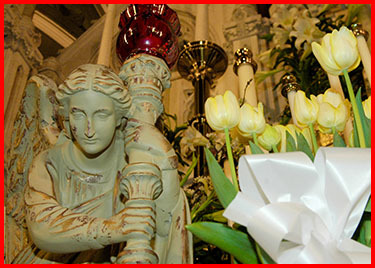 My dear brothers and sisters, a very blessed and joyful Easter to all. Well, we are here tonight because the Comrade has returned. He is alive. The mystery of Easter we express in these wonderful symbols of this liturgy, the light, the water, the new song of Alleluia. Each of us in our baptism was given a candle, as our newly baptized will receive tonight. We are told to keep that candle burning brightly by a life of faith, fidelity, and service. It is the light of Christ that we are given. The symbol of water that we celebrate with here tonight when we bless in the Eucharist is so essential for life. There can be no life without water. And yet we know that in baptism, the water that flows from the side of Christ and through the entire church like a mighty stream and gladdens the city of God is more precious that any water that the earth gives us. We bathe in the stream and we are reborn. It alone transforms the wilderness of our world into a fruitful oasis. 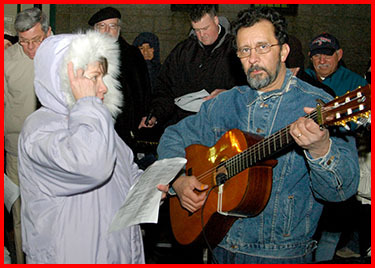 The Alleluia is the new song during Lent. We do not sing the Alleluia. It reappears with the Easter Joy. 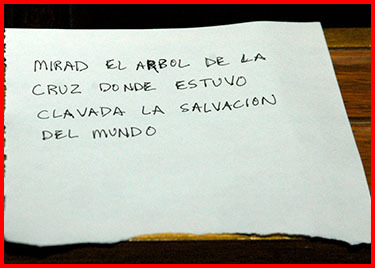 Sin and death, our greatest enemies, have been conquered, our Redeemer lives, every tear has been wiped away. The joy of Easter finds its expression in the joyful song of Alleluia. The Easter story is not a fairytale or a myth, or a legend, it is the history of our family. It is our history. We need to penetrate its meaning so that we can understand who we are, what life is about. Why we’re here and what we need to do with our lives. Jesus’ resurrection was not just a matter of resuming the life that He had enjoyed before. His resurrection brought Him back in a glorified and an eternal body. He could eat and He could drink. He was not a ghost, but at the same time, He could walk through closed doors, He appeared and disappeared. He used this Easter season to teach us that He is to be present in a new way. Through His word, through his Sacraments and through His church. 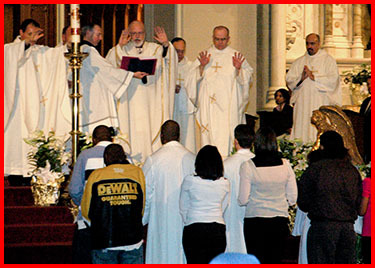 In Easter apparitions, Jesus speaks about the Sacraments. On Easter day, He appears to His apostles and breathes on them and says “Receive the Holy Spirit, who’s sins you shall forgive, they are forgiven them.” He speaks to us of confession. When He appears to the disciples on the road to Emmaus, they recognize Him in the breaking of the break, the Eucharist. Their hearts burned within them, as they heard His words. And before His ascension to the right hand of the Father, He commissions his disciples and says “Go make disciples of all nations, baptizing them in the name of the Father and of the Son and of the Holy Spirit.” Yes, the risen Lord is now present everywhere and always, where ever His Sacraments are celebrated, His word is proclaimed, or where two or three are gathered in His name. The last apparition of Jesus in the New Testament is in the Acts of the Apostles. The risen Lord, after His ascension, makes one more appearance, on the Road to Damascus where Saul, later Paul, is in hot pursuit of the Christians. Saul is searching them out to arrest them and prosecute them. And suddenly, the risen Lord appears and says “Saul, Saul, why are you persecuting me?” And Saul says, “Who are you?” And Christ answers, “I am Jesus, whom you persecute.” In other words, if you persecute the Church, you persecute Christ. Jesus is one with His Church. Later on, when Paul writes his epistles, he talks about the Church as the Body of Christ. He is our head, we are the body. We are one with Him. Our Easter joy is based on the fact that Jesus is alive. Our redeemer lives and because He is alive, our Sacraments are real. 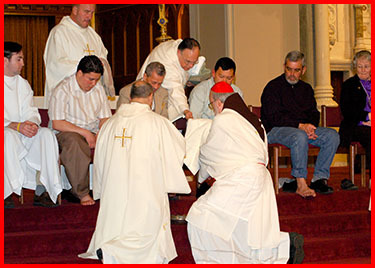 And the community of the Church forms His body. But knowing the resurrection brings with it a responsibility. In the Gospel, we see how those who found the empty tomb or who had an encounter with the risen Lord were given a mission. Knowledge brings with it responsibilities. If we know the risen Lord, we know that He wants us to be His witnesses, to announce to the world the Good News. We do that by following Him in the way that we live our lives, so that our lives will be an invitation to others to be Jesus’ friends and disciples. One of the first ways we begin to fulfill that mission is by living the Commandments, to keep Holy the Lord’s day. The Lord’s day is Sunday. Each Sunday is a little celebration of Easter. As part of a worshiping community, we are building up the Body of Christ and laying the foundations for a civilization of love. We are an Easter people. But it is when we gather for the Sacraments with the community of the risen Lord that we find the strength and the direction so that we can follow the Lord and make His presence felt in our world. Tonight it is such a joy to welcome our new Catholics in our midst. 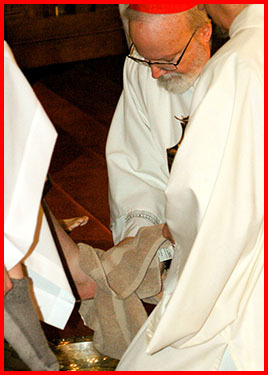 We will all renew our baptismal vows together with you and pledge ourselves to be faithful Catholics, a missionary and welcoming community where you will find a spiritual home. We Catholics are one billion in the world today. We come in all sizes, shapes and colors and speaking every language imaginable. Tonight, we are so happy that over 500 are being baptized in the churches throughout the Archdiocese, being received into our Catholic community. We welcome you aboard and we thank you for accepting the Grace to become our brothers and sisters in the household of the faith, the Catholic Church. May you walk always in that newness of life that is the joy of Easter. God bless you. 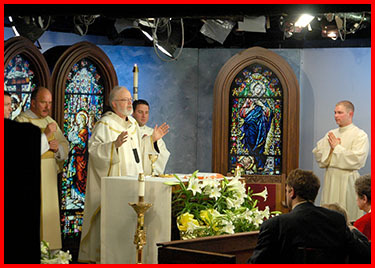 On Easter Sunday morning, I traveled to the studios of WHDH Channel 7 for our traditional Easter Sunday televised Mass. 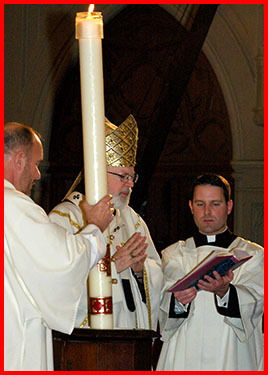 The television Mass gives those who are unable to make it to church the opportunity to share in the liturgy with us. 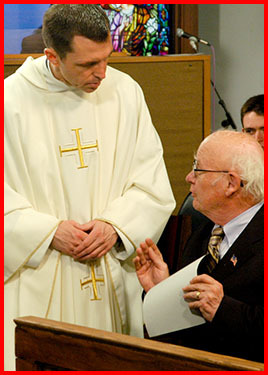 We are all very grateful to Father Bob Reed and Jay Fadden of CatholicTV for the great ministry they do.